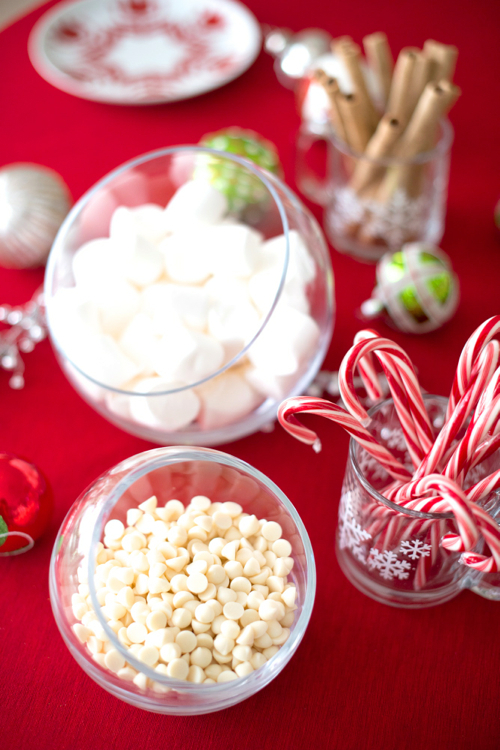 Host a Hot Cocoa Bar! During the last holiday season, we got it into our heads that we wanted to invite a whole bunch of families over for dinner. Not all at once like a holiday party — we wanted to have them over one family at a time. We liked the idea of getting to hang out and talk with one family, a real chance to get to know them better. But we quickly realized, we couldn’t make dinners work. It was a combination of holiday over-scheduling and feeling like a whole bunch of dinner parties in one month was too much pressure. So we came up with an alternative plan. We stocked our pantry with supplies, and then whenever we had a spare evening, we would make a last minute phone call or send an email and invite a family over for a Hot Cocoa Bar. Essentially: Hey, can you guys come over after dinner for hot cocoa? It was easy on relationships. There were no invitations to send and no rsvp-ing. If the first family we called couldn’t make it, no stress, we would try them on a future date, and call another another family instead. Because it was casual and we didn’t know when it was going to happen or how often, we didn’t make a list of invitees and worry that someone would feel left out. It was easy on prep. Something about it being last-minute made it easy for me to feel like the house was presentable enough — meaning I didn’t stress about deep-cleaning. 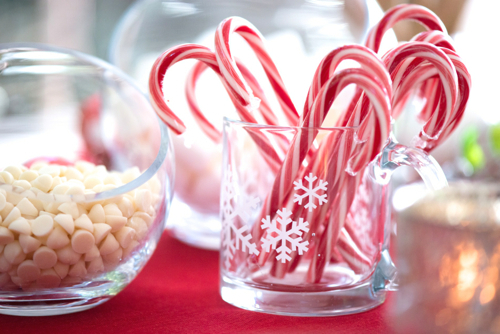 And while a dinner party involves a lot of preparation and cleanup, a hot cocoa bar doesn’t. You can stock up once and be ready for a dozen parties. No party favors needed. It was easy on schedules. A hot cocoa bar doesn’t have to take long, so sometimes friends would stay an hour, other times, they’d stay late into the night (age of kids and bedtimes was a big factor). It wasn’t on anyone’s calendar, including ours, so there was no thinking about what to wear or coming up with hostess gift or wondering if you’d be in the mood for the party. It was last minute and spontaneous — which means we didn’t make the call and extend the invitation unless we really wanted to, and our guests didn’t say yes unless they really wanted to (last minute things are easy to say no to). So no one was stuck at an event they didn’t want to be at. 1) Stock your pantry. Find a good classic hot cocoa mix or recipe — nothing particularly flavored— and keep the mix or ingredients stocked. Keep extra milk in the fridge and whipped cream too. 2) Check your cupboards. Think about what you’ll serve the hot cocoa in. Maybe you have holiday mugs that you pull out every December. Or maybe you’ll mix and match your everyday mugs. See what you’ve got on hand — if it can handle hot liquid, you’re good to go. 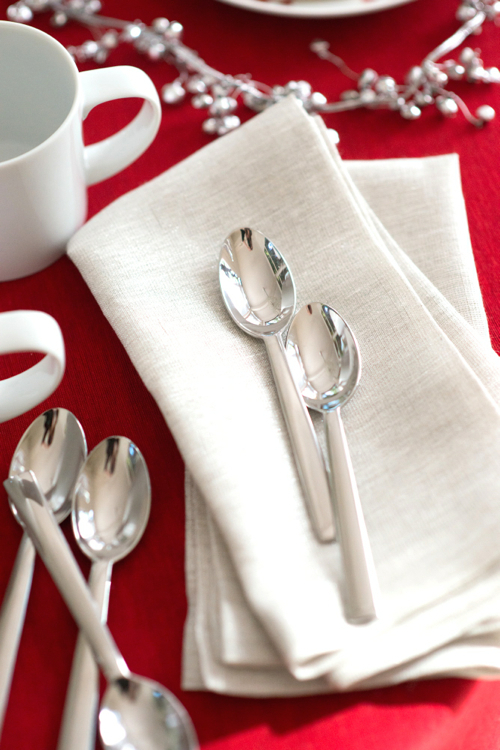 Your basic checklist is mugs, spoons, and napkins. 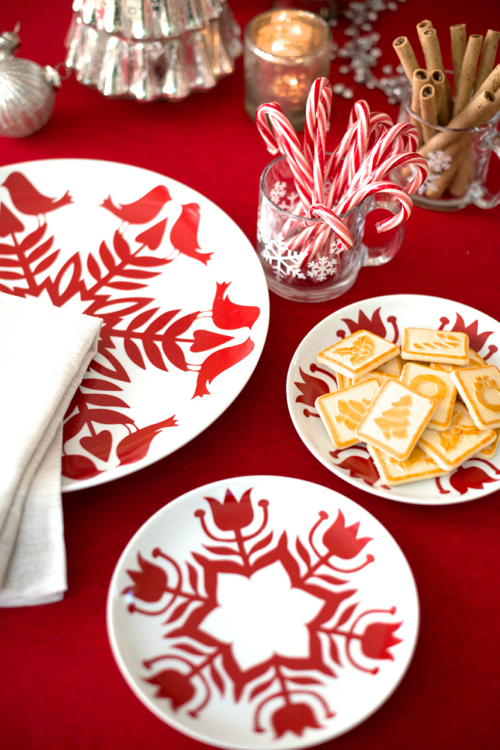 You can put out your favorite red tablecloth too. – baking chips — milk chocolate, butterscotch, white chocolate, mint, etc. I should note, we have never served all of these mix-in options at once. Having 2 or 3 things to customize your cocoa is plenty to make the whole thing feel extra special. And happily, you can stock up on any or all of this so that you don’t have to run to the store at the last minute. 4) Keep a pot of hot cocoa warming on the stove. When guests arrive, let people serve themselves and add their preferred mix-ins. Then hang out. Sing Christmas Carols. Go on a neighborhood walk to look at lights. Admire your holiday decorations. Read a chapter from The Best Christmas Pageant Ever. Do whatever it is you do! And that’s it. Easy as pie. A simple casual gathering that will last an hour or two (or longer if everyone is into it!). An easy, happy way to connect with the people you love over the holidays. No stress involved. Now it’s your turn. 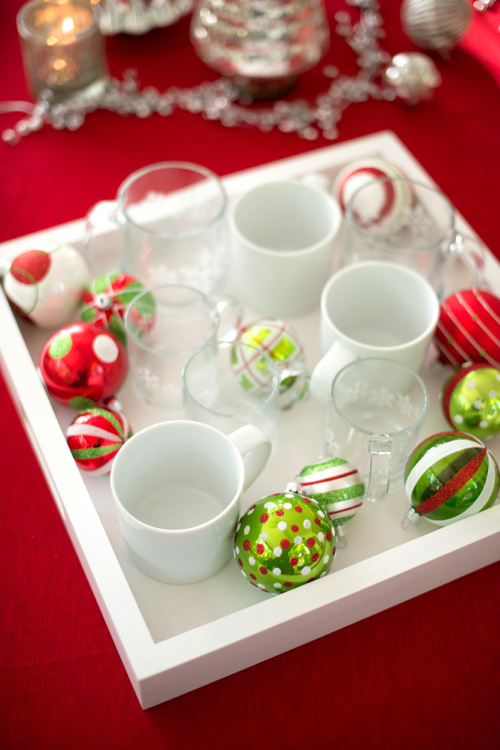 How do you feel about entertaining during the holidays? 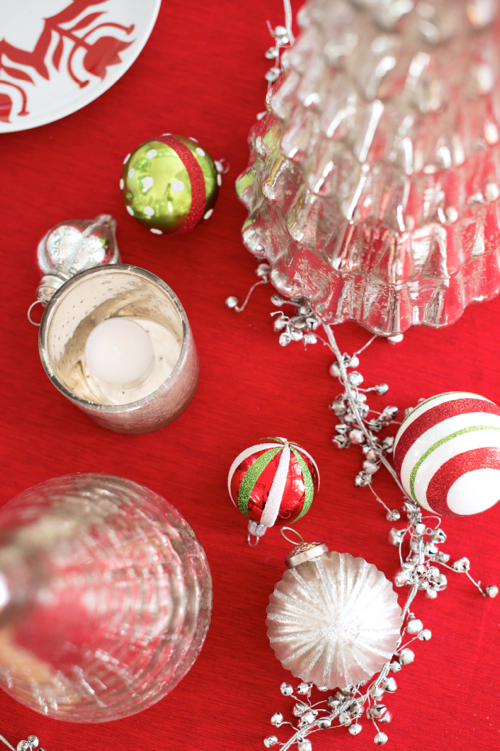 Do you host an annual Christmas party? Maybe something fancy? For about 10 years in a row, we hosted an annual Christmas Recital, and I loved it! Or maybe you prefer something more humorous — like a crazy holiday sweater party? 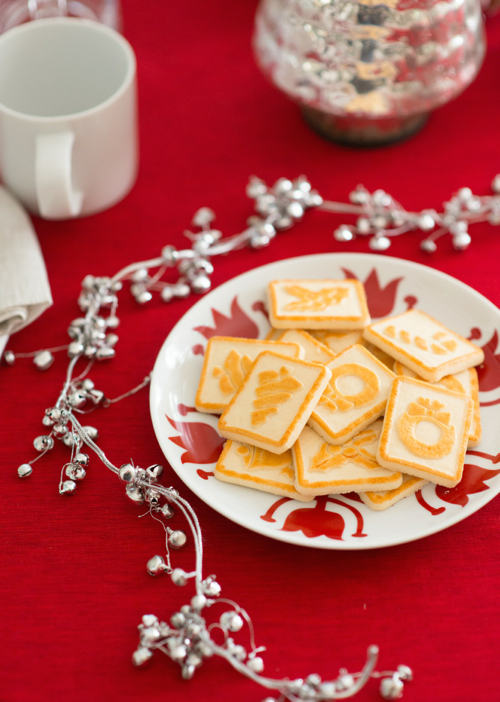 Have you ever gone to a cookie exchange party? 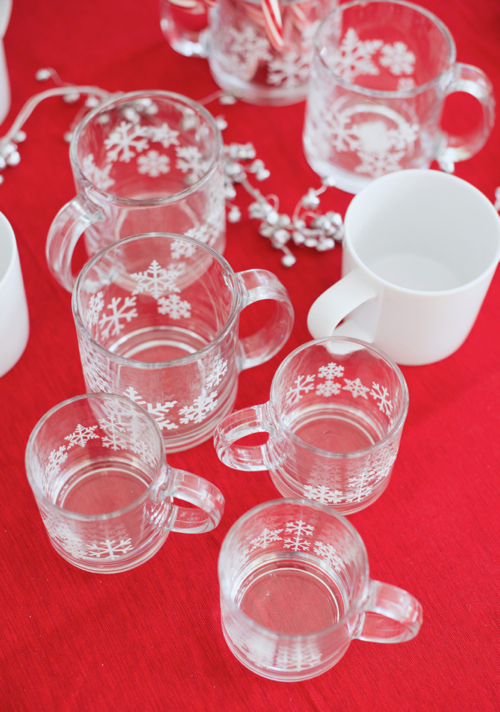 Or maybe you dread holiday entertaining altogether. 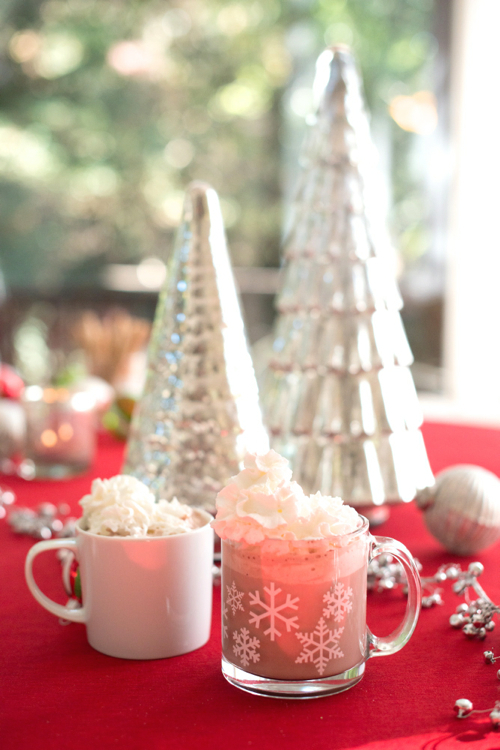 Would a hot cocoa bar gathering sound fun to you? 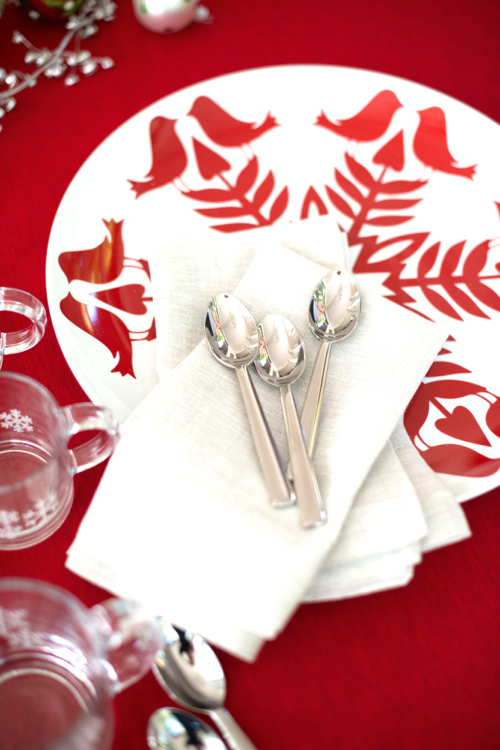 I’d love to hear your holiday entertaining stories! P.S. 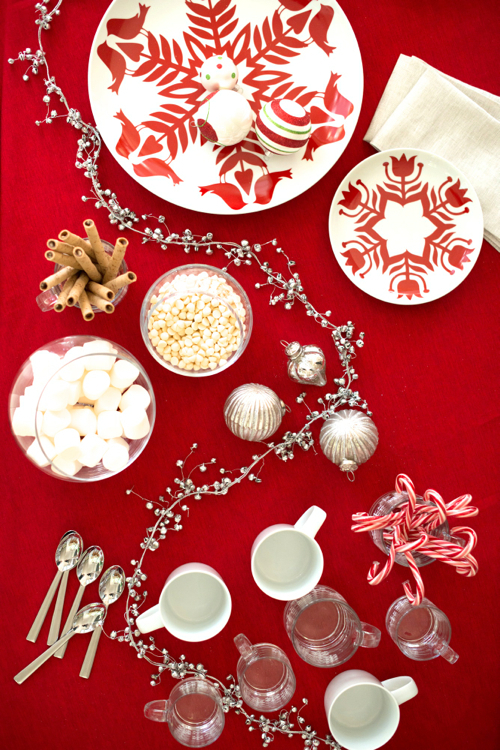 — I picked out a whole bunch of gorgeous holiday wares from Crate & Barrel for these photos. Photos by Kristen Loken for Design Mom. I love this idea, simple, welcoming and festive. We do a somewhat British version with mince pies, Christmas cake, sherry (for the adults) and a hot chocolate with a dollop of whipped cream for the children. But I love the spontaneity of this – will have to try it. Thank you! Your British version sounds incredibly charming. And your comment reminds me: I don’t think I’ve ever eaten a mince pie! Do you have any suggestions for what hot chocolate mix or recipe to use! Some teens from my church introduced me to Abuelita and it’s my preferred hot cocoa of the moment. It comes in paper wrapped round disks of hard chocolate and you whisk it into hot milk. I can find it in Mexican Food aisle of my regular grocery store. So yummy! It’s made by Nestle so it’s probably widely available, but I was only recently introduced to it. I love that quote from Polar Express! We honeymooned in November in Italy a few years back and all the little cafes in the northern part of the country kept hot pots of what I’d consider liquid ganache at the ready for hot chocolate lovers. I couldn’t believe what we’d all been missing stateside this whole time! One funny thing that happened was I tried to order a chocolate martini at one of these cafes, and the bartenders had never heard of one and by the looks of their stock didn’t have the stuff. They told me they would improvise and I ended up with a teacup of hot chocolate (panache!) with a pool of vodka sitting on top since the chocolate was too dense for the emulsion to work. I still laugh about it! I totally know those pots of liquid chocolate! They are so decadent. Italy wins at food. My sister put a hot chocolate bar together last year for a shower she hosted and our family has been reaping the benefits since. She bought about 20 of .99 mugs from Ikea and keeps them on a big tray so we can easily pass them around the extended family for our own hosting. I agree — this is the perfect simple and fun way to have friends over without being fussy or over the top. I love that you guys pass the supplies around. Brilliant! I love this idea. So simple and easy! I’ve hosted cookie decorating playdates in the past. They were fun, but boy was it messy. Adult adaptation (assuming driving isn’t a concern): include nips bottles of Kahlua, Framboise, or Bailey’s to use as mix-ins! Lovely idea! It’s so simple and casual… and so perfect! I have a bunch of teenagers coming over for s’mores on Thursday night, and you just totally upped my game. Thank you! If I lived nearby, I would invite myself over. Ten points for s’mores night! I’m not at all affiliated with this company, but a housemate my senior year of college had a “Cocomotion” – essentially a heated stir plate that made *perfect* hot cocoa every time. It’s now under the “Mr. Coffee Cafe Cocoa Maker” label, and it’s my favorite. It just makes cocoa taste so much better; perfect temperature, no lumps, yum. Sounds genius! Thanks for the link, Bridget. I love everything about this idea! We have a neighborhood luminaria night, on the 23 and everyone puts out luminarias and we have a 1 hour meet and greet outside with a fire pit and hot cocoa. Neighbors are all invited to come visit and warm up while we enjoy the neighborhood all lit up! Some people bring goodies to share, maybe I’ll bring out a couple mix in options this year. I like the idea of one on one time with families though, we may try this. Thanks! Sounds like you have the very best neighborhood ever! Sounds like a fun idea! Alas, with 3 small children aged 5 and under and many of our friends in the same boat, there isn’t even an hour to spare between getting home from work, eating dinner, and bedtime. Perhaps I’ll put this in my calendar for 2022? And dare I say a party favour is never needed when hosting dinner. I mean, is that a thing? Can we just invite people over for dinner without making a 5 course meal and serving it on China at a table whose setting we’ve been working on for 2 weeks? Simplicity, friends. We need more of it. But oh! Christmas morning is so sweet at those ages. They have pretty much zero expectations and the whole thing is just so lovely and magical! I love this idea! For the past several years, we have hosted a HUGE Christmas party the weekend before Christmas. It *is* a lot of work, but we love it. I make 6 to 8 kinds of soup and break out the crockpots. I also make a bunch of no-knead breads to go with the soups ahead of time. Bottles of seltzer and soda in a bucket, a mixed juice bar, and cookies provided by guests. We sing carols around the piano and celebrate with our friends, neighbors, and colleagues. I love that you focus on soups! Such a smart way to feed a great big group of people. Your party sounds wonderful! I love hot chocolate bars! I’ve done one the past few years for my daughters birthday (as it’s mostly adult family member in attendance, in the depth of snowy January), and it is always a hit. Homemade marshmallows, peppermint oil, and pinch bowls of cinnamon and chili are some of my favourite mix-ins. Bonus, having a self-serve hot beverage station available saves my husband from playing barrista through the whole event! Great ideas! Now I want to try adding chili. And I’m working on a post about homemade marshmallows. Woo hoo! I like the fact that it is a non-alcoholic choice.